A tactical look and feel in a larger blackwash™ knife. The new Kershaw Lifter Folding Blade Knife offers a tactical modified tanto blade and a tough, machined style. The BlackWash finish gives it an already-worn-in look, yet the finish isn't just for looks. A tactical look and feel in a larger blackwash™ knife. 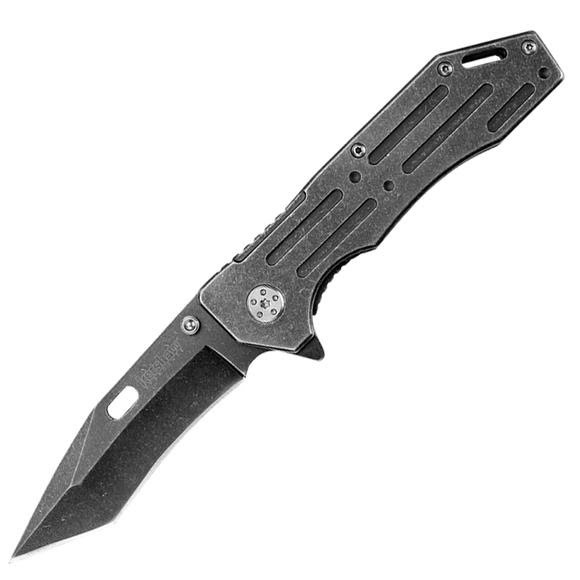 The new Kershaw Lifter Folding Blade Knife offers a tactical modified tanto blade and a tough, machined style. The BlackWash finish gives it an already-worn-in look, yet the finish isn&apos;t just for looks. The coating provides an extra measure of protection for the metal, and the BlackWash helps hide any additional scratches you put on the knife during normal use. The Lifter is equipped with SpeedSafe® assisted opening for fast and easy one-handed opening. It opens neatly with the built-in flipper or thumbstud. A sturdy frame lock safely secures the blade open during use, and then closes easily for storage or carry. The all-steel design really shows off the BlackWash finish. The Lifter includes Kershaw&apos;s deep-carry pocketclip so the knife rides comfortably low in the pocket for discreet carry.